Today at One Stop Craft Challenge we have a new challenge theme - Texture. Adding texture to a card is so much fun! Add some flowers, brads, layers, embossing... there is so many ways to add texture to a project. Head over to the blog Here and enter your project! Make sure to check out the DTs' samples too! I had fun with this card and created a beachy summer themed card. To this card I added sandals (LifeStyle Craft die), Doily (MFT die), Doily border (MFT die), Tag and sentiment (MFT die and stamp), fish brads, crystals, flowers. It makes me want to be sitting on the beach! LOL. Are you ready for beach weather? How gorgeous - I love the colour combo and layout! Thx for sharing with us at Ladybug Crafts Ink! Fabulous card Dawn! I love the flip flops and your dp is so pretty. Thanks for joining in the Meljen's Designs coastal challenge this week. Love the flip flops - I am ready for a walk on the beach - lol. I'm glad I followed you here from the One Stop Craft Challenge, I'm also linking up too. Oh I love those flip flops! Too cute; love the beach-y theme! Great card; thanks for joining us at LCI this week! The flip flops are totally fun! 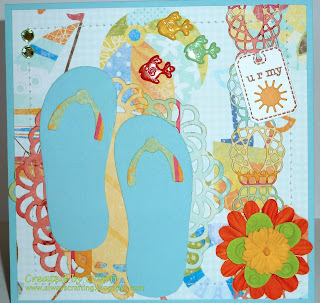 Great summer card, thanks for sharing it with us at Fab n Funky this week! Such a wonderful summery card! I love the little fish! What a lovely card! I like your idea aboutflip flops. So cute! Cute card! Love the flip flops! Thanks so much for joining us at Meljen's Designs!